Frantic over the flood of evidence that shows that climate change is a natural phenomenon and is not made significantly worse by fossil fuel use, which runs contrary to the narrative that fossil fuel use is slowly killing the planet, officials in two states have begun using government power to punish those who dare to speak against the climate change demagoguery. Von Spakovsky’s article in The Daily Caller continues: “Neither Harris nor Schneiderman recognizes the outrageousness of what they are doing — which amounts to censoring or restricting speech and debate on what is a contentious scientific theory. 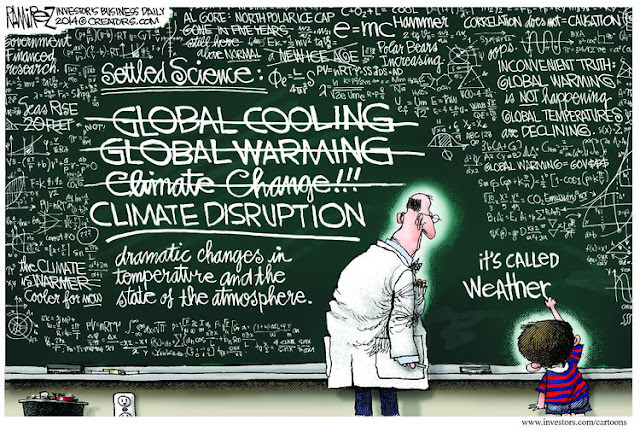 In fact, they want not just to stop anyone who questions the global warming theory from being able to speak; they want to punish them with possible civil sanctions or even criminal penalties.” He goes on to suggest the two AGs badly need a refresher course on the First Amendment. While trying to punish contrary opinions through government oppression is fairly new to the climate change debate, proponents of human-caused climate change have long been guilty of hiding inconvenient data, distorting and manipulating data, and ignoring a more recent and more accurate method of measuring the Earth’s temperature that does not produce “favorable” data. For example, 37 years of satellite-based instrument measurements have provided the world's most accurate and unbiased temperature data. These measurements are free from coverage gaps and siting problems – such as artificial surfaces like concrete, asphalt, and heat sources like air conditioner exhausts – that pollute measurements of land-based instruments. Satellite measurements show no warming of the climate for 18 recent years. Despite their own satellite data, NASA advances theories based upon land-based measurements, which support the human-caused warming theory. Mike van Biezen addressed the satellite measurement result in an article published on The Daily Wire online discussing ten of the “many scientific problems posed by the assumption that human activity” is causing climate change. In his commentary, the adjunct professor of physics, mathematics, astronomy and Earth science at Loyola Marymount University and Compton College, acknowledges things he says we know to be correct, such as that the global average temperature has increased since the 1980’s; since the 1980’s glaciers around the world are receding and the ice cap of the Arctic Ocean has lost ice since the 1980’s, especially during the summer months; and that the average global temperature for the last 10 years is approximately 0.35 degrees centigrade higher than it was during the 1980’s. Biezen provides scientific arguments to refute those commonly advanced ideas, and explains why they fail to demonstrate a connection to climate change from human activity, threatening the comfort and success of human-caused climate change advocates. The American left, whose ideas routinely fall to logical counter-arguments, frequently resort to force of one sort or another to combat their opponents. Desperation clearly has set in, as evidenced by the radical and tyrannical use of government force by the California and New York AGs to silence dissent. But they and others who think they can quiet the voices of dissent should remember that the United States thrives because it protects its citizens’ right to think for themselves and make their own decisions based on their own preferences. Whatever you believe about human activities contributing to changes to Earth’s climate, honest people of all ideological persuasions must agree that if you have to deceive the public in order to gain support for your ideas, perhaps there is something fundamentally wrong with those ideas.